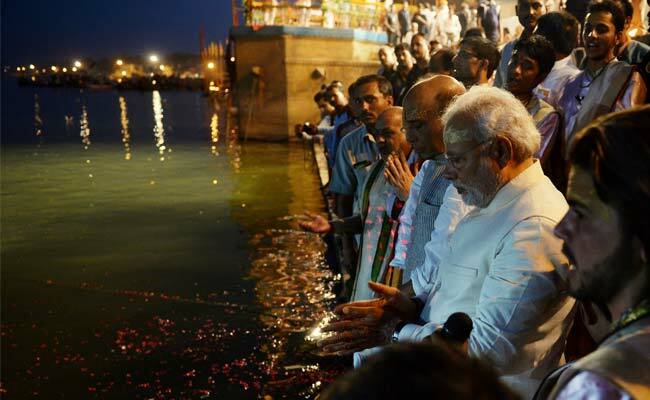 File Photo: Narendra Modi performs the "Ganga Puja" with Rajnath Singh and other party leaders on the banks of the River Ganga in Varanasi on May 17. Mumbai: Prime Minister Narendra Modi's ambitious initiative to clean up the river Ganga has attracted interest from Germany, which is keen on providing its expertise to carry out the multi-billion dollar project. The Modi government is determined to clean up the Ganga which has become heavily polluted due to industrial and human waste. It has allocated Rs 2,037 crore for the task in its first Union Budget presented last month. "There is an improved sentiment in the country, which makes it an attractive destination for Germany to do business with. Apart from other sectors, we would like to assist the government in cleaning up the Ganges, which is an ambitious project of the new government," German deputy consul general Michael Ott told PTI. He said that since his country has the experience in this area after it cleaned the longest European river, the 1,232-km Rhine, it can provide its expertise to the Modi government to take up the mammoth task. "The Rhine, which was the most polluted river in the Europe, is so clean today that the water can be used for drinking as well. We would like to participate in this initiative and I believe we will be able to do it," Mr Ott said. The government has created a separate ministry, the Ganga Rejuvenation Ministry, under Uma Bharti. It is also planning to set up an NRI fund to boost the Ganga cleaning efforts. The army has also proposed to set up a task force under a retired Lieutenant General to carry out the project efficiently. The army is understood to have submitted a proposal to the government to set up a task force under a retired Lt General with a team of 40 officers who would help in cleaning the holy river. The over 2,500-km long Ganga river flows through one of the most densely populated regions of the Gangetic Plains, supporting a population of over 400 million, almost a third of the national population. Mr Ott further said that Germany is also keen on investing in water waste and sewage treatment as well as renewable power sectors, apart from education and healthcare.